White oak is abundant across much of the eastern US reaching its western limit at about the Missouri River where it just reaches into southeast Nebraska. It's an excellent ornamental tree because of its broad round crown, dense foliage, and purplish-red to violet-purple fall color. It is a large, stately tree that grows up to over 100 feet tall, and 38 to 50 inches in diameter, with a round to wide spreading irregular crown. White oak bark is whitish or light gray, varying from scaly to irregularly platy or ridged and furrowed. Leaves are simple and alternately arranged on the stems; they are 5-6 inches long and have a rounded tip and wedge-shaped base, with evenly notched edges; leaves are bright green above and whitish underneath. Male flowers are green and 2-4 inches long, while female flowers are reddish and they appear as single spikes with the leaves. Like bur oak, it is extremely important in aiding biodiversity providing food and habitat to an incredible variety of important animals. The acorns are eaten by squirrels, blue jays, crows, red-headed woodpeckers, deer, turkey, quail, mice, chipmunks, ducks, and raccoons. 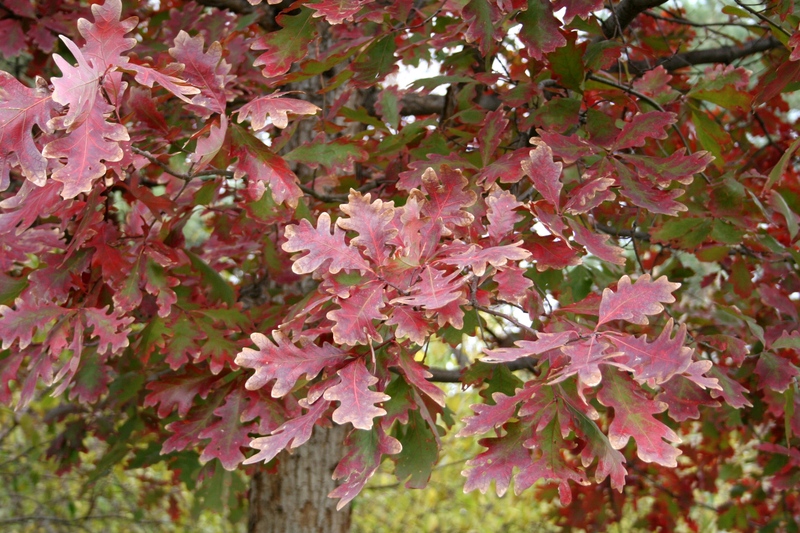 The trees distinctive glossy green, broadly-lobed leaves develop a nice dusty-red fall color and are often retained on the tree well into winter.